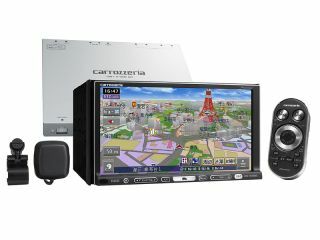 Pioneer's Carrozzeria sat-nav units now come with more fittings than most cars. Also on show at CEATEC in Japan today, we had the latest in Pioneer's range of car satellite-navigation systems that come with everything on ... and then some. The Carrozzeria range has long set the standards for others to follow, but the nine new models add just about everything possible to the mix. The top of the range, ¥262,500 (£1,113) AVIC-HRZ009G model goes on sale at the end of October with an emphasis not just on sat-nav, but also on entertainment. With a digital terrestrial TV tuner, a 7-inch widescreen, DVD and DivX video and MP3, WMA and AAC audio playback, Pioneer's focus on the non-driving parts of the car experience are clear. Throw in a 40GB hard drive and encoding software for ripping CDs to MP3s and it's just like having a media-center PC in the dash. Other models in the range feature a pick-and-mix selection of in- or on-dash mounts, smaller screens, MiniDisc players, analogue TV tuners and good, old-fashioned radios, so there's no excuse for being bored next time you're stuck in one of Japan's monster traffic jams.